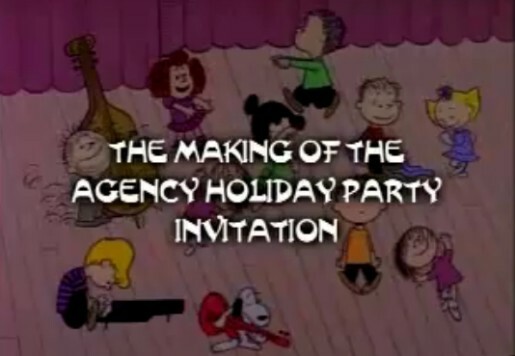 Charlie Brown and the Peanuts gang have had their Christmas special updated to focus on the world of the advertising agency this year, with “The Making of the Agency Holiday Party Invitation”, a dubbed video doing the rounds this week. No one has owned up to making or commissioning the spot although there is a reference to Crispin halfway through. JWT was behind the first screening of Charlie Brown on television, introducing cartoonist Charles Schulz to Los Angeles animator Bill Meléndez, leading to Linus and Lucy endorsing Ford’s line of 1962 Falcons. Lee Mendelson, a documentary director worked with Schulz during 1963 to produce a followup to his baseball documentary, featuring baseball’s worst player, Charlie Brown. Mendelson hoped to introduce television viewers to the Peanuts characters and their creator, using animation by Melendez and music by Vince Guarald and his trio. However he couldn’t find a network or advertiser for the show. All changed when Charlie Brown was featured on the front page of Time Magazine in April 1965. Mendelson received a call from a Coca Cola account executive at McCann Erickso, asking if he had anything that could be used for a Coca Cola sponsored Christmas special. Lying, he said “Sure”. Mendelson and Schulz had a weekend to come up with a script to present on the Monday morning. Coca Cola liked it. CBS didn’t think the show fitted their framework – it was too religious, had jazz music and too many big words. Coca Cola got their way and put the half hour show to air on December 9, 1965. “A Charlie Brown Christmas” was awarded the Emmy for Outstanding Children’s Program of the 1965-66 television season.